I expect autonomous vehicle adoption to come in five stages, each of which will be approximately five years long. We are currently in what I call Stage 0 (2016-2020) Development and Testing. AV development is fully underway with $100 billion invested or committed, and the leading companies are already into testing. By 2019 and 2020, Waymo, Uber, and others will complete testing sufficiently to begin rapidly deploying ARS in Stage 1. Stage 1 (2021-2025) Launch of ARS will be the most exciting stage for AV adoption. As the stage title implies, the focus will be on ARS. There will be what is essentially a land rush by significant players to deploy ARS fleets to critical metropolitan markets during this stage. I estimate that as much as $200 billion will be invested to establish ARS during this stage. By the end of this stage (2025), almost a million ARS vehicles will be deployed generating revenue of more than $150 billion. During this stage, there also will be significant adoption of autonomous vehicles in the retail market and trucking and delivery. The disruptions previously discussed will start toward the end of this stage. Stage 2 (2026-2030) will bring broad acceptance of AVs. ARS will continue to grow with revenue approaching $750 billion, and more than 15% of the miles traveled will be by ARS. The automotive retail market will continue to shrink, and by the end of this stage, potentially 75% of the new vehicles sold will be at least sufficiently autonomous, enabling them to drive on their own most of the time. It is also the stage where the disruptions of AVs will become apparent to everyone. Stage 3 (2031-2035) More Advanced AVs and Stage 4 (3036+) AVs Completely Displace Cars will be the next two stages in the adoption of AVs. By then the horseless-carriage, a little more than a century after its introduction, will be gone into history, replaced by the driverless autonomous vehicle. 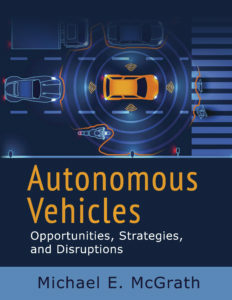 For a more detailed explanation and forecasts, see Autonomous Vehicles: Opportunities, Strategies, and Disruptions.